Late Friday afternoon, shortly after the severe rainstorm, a derrick at the south end of the north wing of the new cellhouse went down with a crash, one man losing his life and three others being injured. The man killed was F. H. Reynolds, of Hamilton county, committed there only twelve days before for two years and six months for larceny. The five lower ribs on his right side were broken loose from the spine and he was otherwise injured internally, it is supposed, as the abdominal cavity was afterwards found to be full of blood. Reynolds did not regain consciousness and death ensued in two hours. He was about 28 years old and unmarried. C. Henderson, also a Hamilton county man who came here May 16th for two and a half years for robbery, was injured in the side and suffered a scalp wound. He is in the hospital. W. B. Pauk, Linn county, incarcerated Nov. 3, 1897, for two years for larceny, had his left foot crushed and it has been amputated. James Ellsworth is a Jones county man and was sent to the pen September 28, 1897, for six years for larceny. He was injured on one foot but not seriously. Dr. McKay attended to the sufferers and the three in the hospital are doing well. Reynolds, the dead man, was held until Monday afternoon in the hope that some relative might be heard from, but without success. The burial in the prison cemetery occurred at three o'clock, Chaplain Byer officiating. All the men were on what is called the platform of the derrick, about twelve or fifteen feet from the ground. (ed.note: click HERE for photo of North House construction). At the time the derrick went down a stone about three tons in weight was being elevated when, for some reason that nobody as yet has been able to discover, the base of the derrick slipped form its socket and fell. A stone over four tons in weight had been lifted by the same derrick. 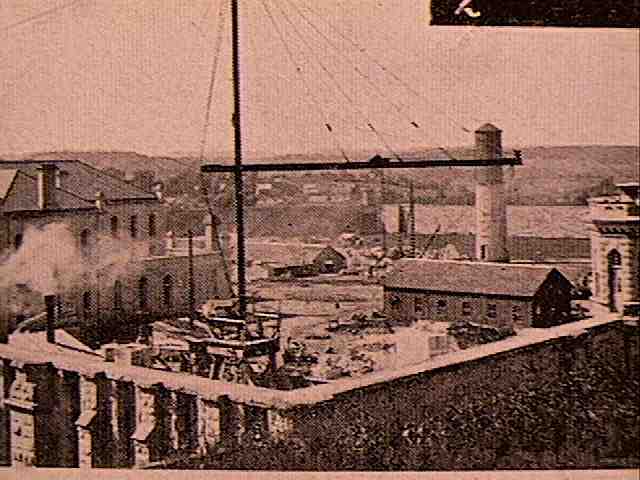 Mr. T. C. Mollett, foreman of derricks, was a sailor fourteen years and foreman of derricks at the State capitol eleven years and sixteen years at Anamosa, and this is the first accident charged up against his remarkable record of forty-one years. Mr. Mollett, it is needless to add, feels very badly over this casualty, though its cause is as much a mystery to him as to all others. Mr. Mollett was just returning from a trip to the quarry and had an exceedingly narrow escape form instant death, the top of the massive 60 foot mast burying itself in the ground less than a yardstick's length from his feet. Warden Hunter and his officers at once inaugurated a thorough investigation and as the disaster was of so grave a nature he telephoned to Gov. Shaw, who happened to be at Clinton on Memorial Day, and the Governor and his wife came up on the Midland Monday evening. He made a careful examination and they took the early Milwaukee train the next morning for Des Moines. The Governor, so far as we are aware, did not express his view of the situation, but if any question, legal or otherwise, should be raised hereafter he will be in possession of the facts so far as they could be ascertained by a searching personal investigation.